A week ago we wrote about our surprisingly pleasant DieHard battery experience at our local Sears automotive store. We now follow up with a story of an even better experience at the main Sears store. The 154 piece Mechanics Tool Set includes 93 sockets in 1/4-, 3/8-, and 1/2-inch drive sizes, both metric and standard sizes, deep and standard depths. The set also has 12 combination wrenches in metric and standard sizes, 3 quick-release ratchets (each drive), 2 extension bars and 44 specialty tools. To keep all of the pieces easily accessible, the kit came with a custom-molded briefcase-style carrying case. 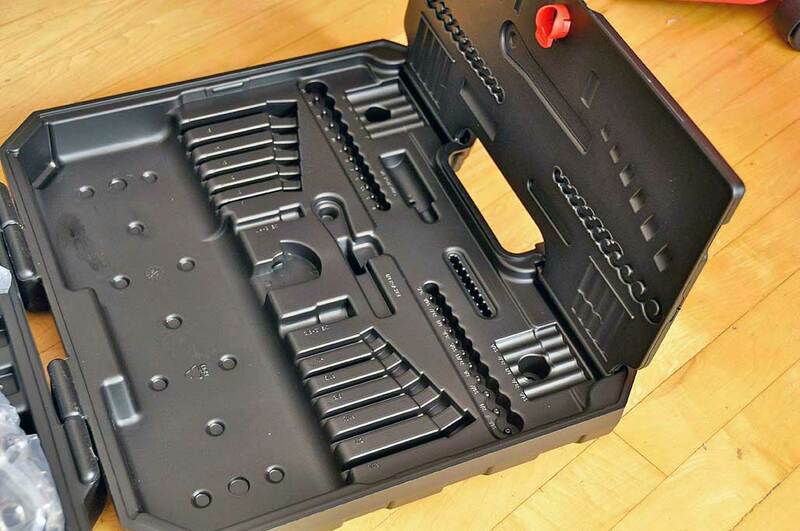 To keep the sockets from falling out when opening the case, there is a locking divider/lid on the top compartment. Drive Sizes: 1/4 in., 3/8 in. and 1/2 in. All of the pieces were sorted and bagged, but we needed to place them into their respective spots. Since the size of each piece was clearly marked on the side, the process was not too onerous and was easier than assembling a jigsaw puzzle. Finding its corresponding location in the case was just a matter of matching up the labels. The quality of the sockets, wrenches, and bits are surprisingly high for a set of tools priced for $150. Maybe even more surprising was that everything had “Made in the U.S.A.” stamped on them. We would have expected that at this price, it would have been “designed” in the USA, but manufactured in China. 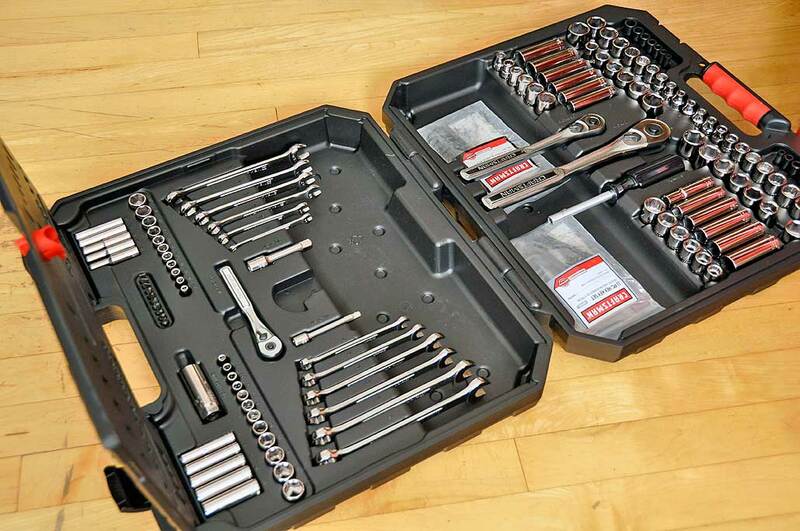 At $150, this 154-pc Craftsman Mechanics Tool set is a great value. For $99, it was an absolute steal. 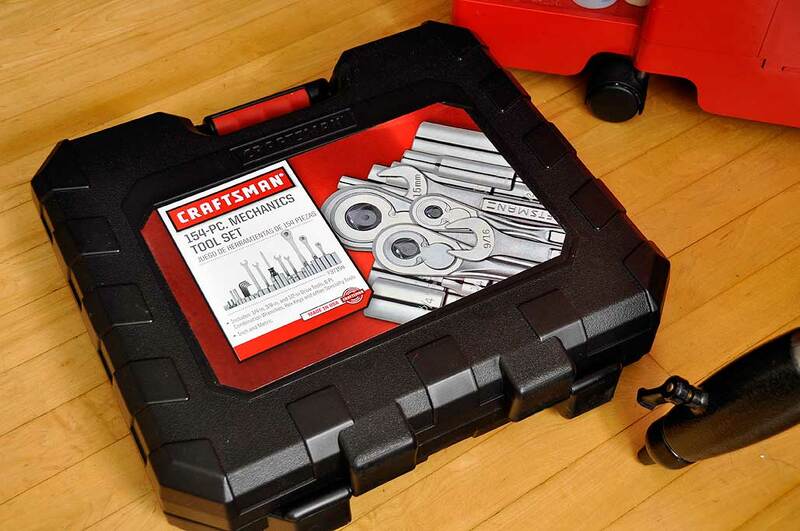 Like all Craftsman products, these tools are guaranteed for life. As the items appear to be of very high quality we don’t expect them to fail. However, if our recent experiences with Sears is any indication, getting warranty service would be 100% hassle-free.